Stamps dated 1288 (= 1871-72). Plate A. Shahi value (position 4). Used on cover with red ink seal, indicative of use from Peshawar, but no cancelling tear. 1288 Plate A (positions 4+11). 1288 Plate A (position 7). Shahi value used in combination with Indian half anna blue. The Afghan stamp is tied by the Nowshera cancel showing that the sender had affixed the postage for both stages of the journey. The cover is annotated on the reverse (in Dari) "This letter should go by the [British Indian] dawk to Peshawar and thence by the Amir's dawk to Kabul. Postage has been paid for both journeys". The "dawk" is the post office. Nowshera April 28th, via Peshawar April 29th , to Kabul. A late usage of Plate A but perhaps not surprising as it has been affixed by the sender who could have bought it many months earlier. 1288 Plate A (position 12). 1288 Plate B Shahi value (position 13). Used on cover, with cancelling tear and faint red ink seal. 1288 Plate C three Abasi values (positions 7, 10 and 13), each bearing a double Kabul swordstroke cancel, sent to Peshawar. 3 Abasi = 1 Rupee = 12 Shahi, making this a 12 x standard weight cover. 1288 Plate C Abasi value (position 4). Used on cover, with cancelling tear and red ink seal. 1288 Plate C Abasi value (position 4, two examples), together with Indian half anna stamp to pay postage in India beyond Peshawar. Used on cover with cancelling tears. Each of the Afghan stamps has, by chance, been tied by one of the Indian cancellations. 1288 Plate C. Abasi value (position 13). Used on cover with cancelling tear. 1288 Plate C. Cover bearing 4 x Sanar values (positions 5, 8, 11, 14), each cancelled over the lion's head by the distinctive "tamma" of Tashkurghan.. Sent to Peshawar. 1 Sanar = 2 Shahi, making this a quadruple rate two postal stage cover. 1288 Plate C. Pair of Sanar values (positions 6 and 9). Used on cover with cancelling tears. 1288 Plate C. Abasi value (position 1). 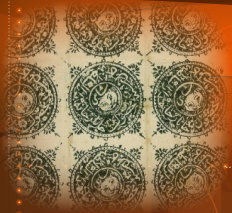 Used on cover with cancelling tear and red ink seal, indicative of use from Peshawar. The manuscript 196 is a talismanic number representing “In the name of God, gracious and merciful”. 1288 Plate C. Abasi (positions 7 and 13). Used on cover from Kabul to Peshawar (front and back shown). The cover is dated in manuscript 23 Zou’iqu’ad 1288 (=3rd February 1872). The sender has annotated the cover “Hurry, Hurry, Hurry”. 1288 Plate D. Sanar value (position 11). Used on cover. 1288 Plate D. Sanar value (position 8). Used on cover with cancelling tear and manuscript tamma mark of Tashkurghan over lion’s head. Peshawar Receiving House mark. 1288 Plate D. Sanar value (position 14). Used on cover with cancelling tear and red ink seal. The red ink seal is indicative of use at Peshawar. 1288 Plate D. Shahi value (position 6).